I was living in a house I didn’t know in a city I didn’t know. The people who lived there were young. They were cheerful, although their faces had a certain toughness, a certain wariness. The house had a lot of rooms. I left objects of mine, including my personal identification and a laptop with new work on it, in various of them. While I was anxious about this I wasn’t worried. I kept track of my things by rehearsing their positions in each room. I visited every room regularly to check that everything remained in its place. Everything was fine until I began to notice that the house was badly built. Living spaces had been constructed out of what had clearly been a condemned building. Then I began to forget where my things were. As I went from room to room looking for them, the house revealed itself as even more badly built. Some of the rooms had collapsing floors. Ceilings and walls seemed solid but were made of draped tarpaulin. The stairs moved under you. First I forgot where my belongings were. Then I realised that I was beginning to forget the layout of the building too. I wasn’t sure which rooms I had visited and which I hadn’t. The structure was increasingly unstable. Lath and rafters showed through. The rooms trembled and wallowed as I moved. My panic increased. I had lost all my objects. I had lost all sense of where I was. I had lost all my identifiers. I didn’t recognise anyone in the house. When I looked out of a window I realised that I had forgotten what country the city was in. I went out there and began to wander about. At first I was absolutely certain where the house was. Capitalism, he wrote in Ways of Seeing, “survives by forcing the majority to define their own interests as narrowly as possible”. It was narrowness he set himself against, the toxic impulse to wall in or wall off. Be kin to the strange, be open to difference, cross-pollinate freely. He put his faith in the people, the whole host of us. The book of his I pick up more & more often as I get older is his collaboration with Jean Mohr, A Fortunate Man: The Story of a Country Doctor. I have a beaten-up old paperback–from the early 70s, I think–which doesn’t get any easier to read without it falling to bits; but it’s now available from Canongate with an introduction by Gavin Francis, who describes it in his first sentence as “a masterpiece of witness”. That was what Berger felt like back then, and what he made me want to become: a witness. Despite being the definition of selfish, the Tories always know when it’s time to pull together–because if they don’t, nobody will get their snout in the trough. While Labour, despite starting from the assumption that we all should work for the common good, face every crisis by factionalising, falling apart and adamantly refusing to co-operate with one another. This has got to mean something, but I am not clever enough to see what it is. The other noticeable thing about this farrago is explanatory failure. People I admired for their political steadiness reveal themselves to be as changeable–as at a loss and dependent on the gossip of the last minute or two to form a plan–as I am. While outside UKIP and the political journalism industry, you sense, even the bigots no longer know what to think. And of course, everyone’s running for cover in one vomit-inducing fantasyland or another as quickly as they can. In later life, Christopher Isherwood felt it necessary to apologise for manipulating his friends so they made better material for fiction; an entire culture is going to be apologising for itself in a generation’s time. The only time Helen had spoken to him was when she caught him looking at the shrinkwrapped books in the chiller cabinet: “We’re a wholesaler, really. We sell on in bulk.” The self-deception of this was his introduction to the business; or to that side of it. From then on he would make two or three trips a week to similarly shabby premises–crystal shops, candle parlours, short-let niche operations selling a mix of cultural memorabilia and pop merchandise from two or three generations ago–which had flourished along the abandoned high streets of the post-2007 austerity. They were run by a network of shabby voters dressed in cheap business clothes, hoping to take advantage of tumbling high street rents–though their real obsession was with commerce as a kind of politics, a fundamental theology. They had bought the rhetoric without having the talent or the backing. The internet was killing them. The speed of things was killing them. They were like old-fashioned commercial travellers haunting decayed hotel corridors, fading away in bars and single rooms, exchanging order books on windy corners as if it were still 1957–denizens of futures that never coalesced, whole worlds that never got past the natal crisis. Men and women washed up on rail platforms and pedestrianised streets, weak-eyed with the brief energy of the defeated, exchanging obsolete tradecraft like Thatcherite spies. 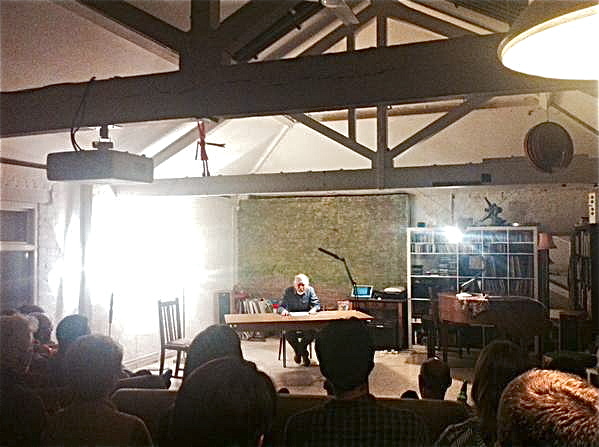 Reading “The Crisis” last Thursday at Irregular Evenings 2, a hidden venue deep in the religio-industrial complex of Stoke Newington, ably organised by Vlatka Horvat and Tim Etchells. Jonathan Burrows and Matteo Fargion were a hard act to follow. A great, mixed audience which included everyone from the #LossLit team to Michael Caines of the TLS and Canongate co-founder Whitney McVeigh. The evening was notable in another way for me, but more of that some other time. If you couldn’t be there for reasons of because, you can still catch the Warwick University audio of the original reading, online here. It looks as if “The Crisis” will have its first print outing in the short story collection–tentatively entitled Found & Lost–which is working its way up the femoral artery and into publishing’s dark heart etc etc even as we speak. News of that very soon, I hope. Adolescence. West London. You always believed a hidden war was being fought, a war nobody would ever admit to. Lay awake at night, listening to bursts of corporate fireworks that seemed too aggressive to be anything other than a small arms exchange; while by day, ground-attack helicopters clattered suddenly and purposively along the curve of the Thames towards Heathrow. You held your breath in moments of prolonged suspense, imagining the smoke trails of rockets launched from the bed of a builder’s pickup in Richmond or Kingston. These fantasy-engagements, asymmetric and furtive, a kind of secret, personalised Middle East, left you as exhausted as masturbation. There was something narcissistic about them. A decade later, everyone was able to feel a similar confused excitement. With the coming of the iGhetti, everyone had a story to tell but no one could be sure what it was. Information was so hard to come by. Between anecdotal evidence and the spectacular misdirections of the news cycle lay gulfs of supposition, fear, and denial. People didn’t know how to act. One minute they heard the guns, the next they were assured that nothing was happening. One day they were panicking and leaving the city in numbers, the next they were returning but rumour had convinced them to throw their tablet computers in the river. The thing they feared most was contagion. They locked their doors. They severed their broadband connections and tanked their cellars. They avoided a growing list of foods. They clustered round a smartphone every summer evening after dark, eavesdropping on the comings and goings of the local militas as they scoured the railway banks and canalsides for telltale astral jelly. Were the iGhetti here or not? It was a difficult time for everyone. Or knows which way up anything is. You need a lot of bolts & sometimes even that’s not enough. There’s no certainty this is the neck or that, even if it is, it’ll hold the head on. Just the usual sounds of the floor being up, probably in the wrong room, & a cheerful sense of applied despair. All morning connecting three feet of pipe to nothing. Fucked ducting. Defibrillators, dessicant dehumidifiers & now something like a lobster the size of a kiddy but without a shell, stuffed in there for reasons no right minded person could entertain. You’re late, you brought the wrong tools & you’re supposed to think of this as the chassis? Then shouts from near a stream (they sound like they come out of the Brueghel in the middle distance) & your mother’s voice from, really, a long time ago, asking what’s the story & advising you put that arm down. You’re in the wrong house again, Jack, & it’s rain later.